The solar wind is a stream of charged particles released from the upper atmosphere of the Sun. This plasmaconsists of mostly electrons, protons and alpha particles with thermal energies between 1.5 and 10 keV. Embedded within the solar-wind plasma is the interplanetary magnetic field. The solar wind varies in density, temperature and speed over time and over solar latitude and longitude. 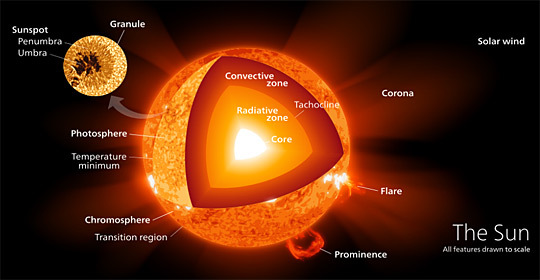 Its particles can escape the Sun’s gravity because of their high energy resulting from the high temperature of the corona, which in turn is a result of the coronal magnetic field. At a distance of more than a few solar radii from the Sun, the solar wind is supersonic and reaches speeds of 250 to 750 kilometers per second. The flow of the solar wind is no longer supersonic at the termination shock. The Voyager 2 spacecraft crossed the shock more than five times between 30 August and 10 December 2007. Voyager 2 crossed the shock about a billion kilometers closer to the Sun than the 13.5 billion kilometer distance where Voyager 1 came upon the termination shock. The spacecraft moved outward through the termination shock into the heliosheath and onward toward the interstellar medium. Other related phenomena include the aurora (northernand southern lights), the plasma tails of comets that always point away from the Sun, and geomagnetic storms that can change the direction of magnetic field lines. The existence of particles flowing outward from the Sun to the Earth was first suggested by British astronomer Richard C. Carrington. In 1859, Carrington and Richard Hodgson independently made the first observation of what would later be called a solar flare. This is a sudden, localised increase in brightness on the solar disc, which is now known to often occur in conjunction with an episodic ejection of material and magnetic flux from the Sun’s atmosphere, known as a coronal mass ejection. On the following day, a geomagnetic storm was observed, and Carrington suspected that there might be a connection, which is now attributed to the arrival of the coronal mass ejection in near-Earth space and its subsequent interaction with the Earth’s magnetosphere. George FitzGerald later suggested that matter was being regularly accelerated away from the Sun and was reaching the Earth after several days. 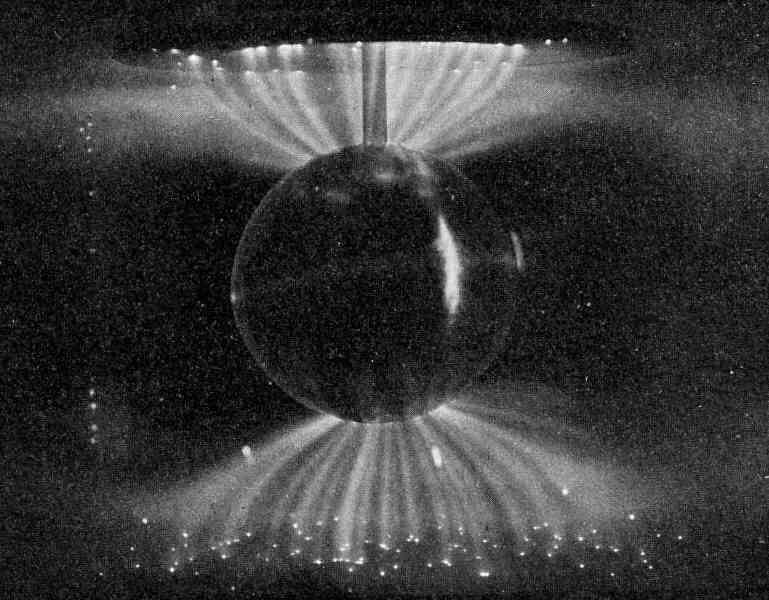 Laboratory simulation of the magnetosphere’s influence on the Solar Wind; these auroral-like Birkeland currentswere created in a terrella, a magnetised anode globe in an evacuated chamber. The first person to suggest that the ejected material consisted of both ions and electrons was Kristian Birkeland. His geomagnetic surveys showed that auroral activity was nearly uninterrupted. As these displays and other geomagnetic activity were being produced by particles from the Sun, he concluded that the Earth was being continually bombarded by «rays of electric corpuscles emitted by the Sun». In 1916, Birkeland proposed that, «From a physical point of view it is most probable that solar rays are neither exclusively negative nor positive rays, but of both kinds». In other words, the solar wind consists of both negative electrons and positive ions. Three years later in 1919, Frederick Lindemann also suggested that particles of both polarities, protons as well as electrons, come from the Sun. Around the 1930s, scientists had determined that the temperature of the solar corona must be a million degrees Celsiusbecause of the way it stood out into space (as seen during total eclipses). Later spectroscopic work confirmed this extraordinary temperature. In the mid-1950s Sydney Chapman calculated the properties of a gas at such a temperature and determined it was such a superb conductor of heat that it must extend way out into space, beyond the orbit of Earth. Also in the 1950s, Ludwig Biermann became interested in the fact that no matter whether a comet is headed towards or away from the Sun, its tail always points away from the Sun. Biermann postulated that this happens because the Sun emits a steady stream of particles that pushes the comet’s tail away. Wilfried Schröder claimed that Paul Ahnert was the first to relate solar wind to comet tail direction based on observations of the comet Whipple-Fedke (1942g). Eugene Parker realised that the heat flowing from the Sun in Chapman’s model and the comet tail blowing away from the Sun in Biermann’s hypothesis had to be the result of the same phenomenon, which he termed the «solar wind». Parker showed in 1958 that even though the Sun’s corona is strongly attracted by solar gravity, it is such a good heat conductor that it is still very hot at large distances. Since gravity weakens as distance from the Sun increases, the outer coronal atmosphere escapes supersonically into interstellar space. Furthermore, Parker was the first person to notice that the weakening effect of the gravity has the same effect on hydrodynamic flow as a de Laval nozzle: it incites a transition from subsonic to supersonic flow. Opposition to Parker’s hypothesis on the solar wind was strong. The paper he submitted to the Astrophysical Journal in 1958 was rejected by two reviewers. It was saved by the editor Subrahmanyan Chandrasekhar (who later received the 1983 Nobel Prize in physics). In January 1959, the Soviet satellite Luna 1 first directly observed the solar wind and measured its strength. They were detected by hemispherical ion traps. The discovery, made by Konstantin Gringauz, was verified by Luna 2, Luna 3 and by the more distant measurements of Venera 1. Three years later its measurement was performed by Neugebauer and collaborators using the Mariner 2 spacecraft. In the late 1990s the Ultraviolet Coronal Spectrometer (UVCS) instrument on board the SOHO spacecraft observed the acceleration region of the fast solar wind emanating from the poles of the Sun and found that the wind accelerates much faster than can be accounted for by thermodynamic expansion alone. Parker’s model predicted that the wind should make the transition to supersonic flow at an altitude of about 4 solar radii from the photosphere (surface); but the transition (or «sonic point») now appears to be much lower, perhaps only 1 solar radius above the photosphere, suggesting that some additional mechanism accelerates the solar wind away from the Sun. The acceleration of the fast wind is still not understood and cannot be fully explained by Parker’s theory. The gravitational and electromagnetic explanation for this acceleration is, however, detailed in an earlier paper by 1970 Nobel laureate for Physics, Hannes Alfvén. In 1990, the Ulysses probe was launched to study the solar wind from high solar latitudes. All prior observations had been made at or near the Solar System’s ecliptic plane. The Sun’s corona, or extended outer layer, is a region of plasma that is heated to over a million kelvin. As a result of thermal collisions, the particles within the inner corona have a range and distribution of speeds described by a Maxwellian distribution. The mean velocity of these particles is about 145 km/s, which is well below the solar escape velocity of 618 km/s. However, a few of the particles achieve energies sufficient to reach the terminal velocity of 400 km/s, which allows them to feed the solar wind. At the same temperature, electrons, due to their much smaller mass, reach escape velocity and build up an electric field that further accelerates ions away from the Sun. The total number of particles carried away from the Sun by the solar wind is about 1.3×1036 per second. Thus, the total mass loss each year is about (2–3)×10−14solar masses, or about one billion kilograms per second. This is equivalent to losing a mass equal to the Earth every 150 million years. However, only about 0.01% of the Sun’s total mass has been lost through the solar wind. Other stars have much stronger stellar winds that result in significantly higher mass loss rates. The solar wind is observed to exist in two fundamental states, termed the slow solar wind and the fast solar wind, though their differences extend well beyond their speeds. In near-Earth space, the slow solar wind is observed to have a velocity of 300–500 km/s, a temperature of 1.4–1.6×106 K and a composition that is a close match to the corona. 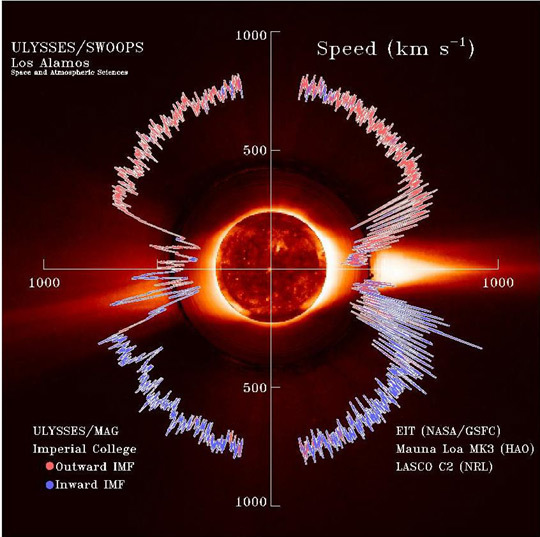 By contrast, the fast solar wind has a typical velocity of 750 km/s, a temperature of 8×105 K and it nearly matches the composition of the Sun’s photosphere. The slow solar wind is twice as dense and more variable in nature than the fast solar wind. The slow solar wind appears to originate from a region around the Sun’s equatorial belt that is known as the «streamer belt», where coronal streamers are produced by magnetic flux open to the heliosphere draping over closed magnetic loops. The exact coronal structures involved in slow solar wind formation and the method by which the material is released is still under debate. Observations of the Sun between 1996 and 2001 showed that emission of the slow solar wind occurred at latitudes up to 30–35° during the solar minimum (the period of lowest solar activity), then expanded toward the poles as the solar cycle approached maximum. At solar maximum, the poles were also emitting a slow solar wind. The fast solar wind originates from coronal holes, which are funnel-like regions of open field lines in the Sun’s magnetic field. Such open lines are particularly prevalent around the Sun’s magnetic poles. The plasma source is small magnetic fields created by convection cells in the solar atmosphere. These fields confine the plasma and transport it into the narrow necks of the coronal funnels, which are located only 20,000 kilometers above the photosphere. The plasma is released into the funnel when these magnetic field lines reconnect. where pressure P is in nPa (nanopascals), n is the density in particles/cm3 and V is the speed in km/s of the solar wind. Both the fast and slow solar wind can be interrupted by large, fast-moving bursts of plasma called interplanetary coronal mass ejections, or ICMEs. ICMEs are the interplanetary manifestation of solar coronal mass ejections, which are caused by release of magnetic energy at the Sun. 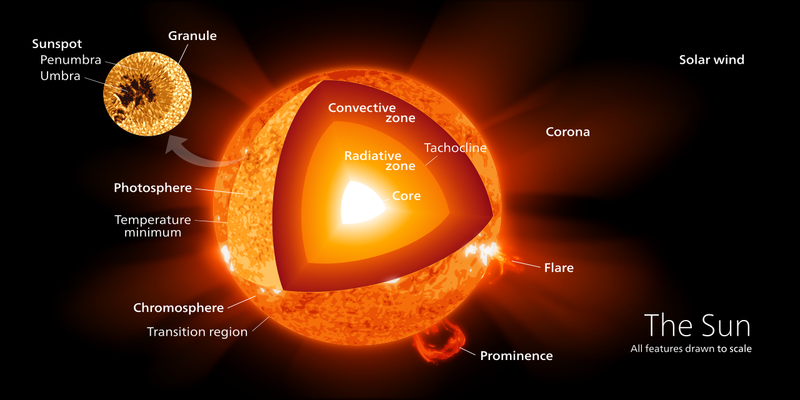 CMEs are often called «solar storms» or «space storms» in the popular media. They are sometimes, but not always, associated with solar flares, which are another manifestation of magnetic energy release at the Sun. ICMEs cause shock waves in the thin plasma of the heliosphere, launching electromagnetic waves and accelerating particles (mostly protons and electrons) to form showers of ionizing radiation that precede the CME. When a CME impacts the Earth’s magnetosphere, it temporarily deforms the Earth’s magnetic field, changing the direction of compass needles and inducing large electrical ground currents in Earth itself; this is called a geomagnetic storm and it is a global phenomenon. CME impacts can induce magnetic reconnection in Earth’s magnetotail (the midnight side of the magnetosphere); this launches protons and electrons downward toward Earth’s atmosphere, where they form the aurora. ICMEs are not the only cause of space weather. Different patches on the Sun are known to give rise to slightly different speeds and densities of wind depending on local conditions. In isolation, each of these different wind streams would form a spiral with a slightly different angle, with fast-moving streams moving out more directly and slow-moving streams wrapping more around the Sun. Fast moving streams tend to overtake slower streams that originate westward of them on the Sun, forming turbulent co-rotating interaction regions that give rise to wave motions and accelerated particles, and that affect Earth’s magnetosphere in the same way as, but more gently than, CMEs. Over the Sun’s lifetime, the interaction of its surface layers with the escaping solar wind has significantly decreased its surface rotation rate. The wind is considered responsible for comets’ tails, along with the Sun’s radiation. The solar wind contributes to fluctuations in celestial radio waves observed on the Earth, through an effect called interplanetary scintillation. Schematic of Earth’s magnetosphere. The solar wind flows from left to right. Where the solar wind intersects with a planet that has a well-developed magnetic field (such as Earth, Jupiter and Saturn), the particles are deflected by the Lorentz force. This region, known as the magnetosphere, causes the particles to travel around the planet rather than bombarding the atmosphere or surface. The magnetosphere is roughly shaped like a hemisphere on the side facing the Sun, then is drawn out in a long wake on the opposite side. 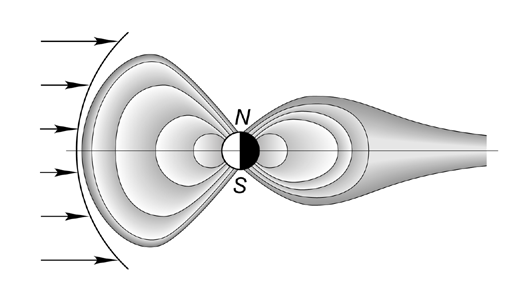 The boundary of this region is called the magnetopause, and some of the particles are able to penetrate the magnetosphere through this region by partial reconnection of the magnetic field lines. The solar wind is responsible for the overall shape of Earth’s magnetosphere. Fluctuations in its speed, density, direction, and entrained magnetic field strongly affect Earth’s local space environment. For example, the levels of ionizing radiation and radio interference can vary by factors of hundreds to thousands; and the shape and location of the magnetopause and bow shock wave upstream of it can change by several Earth radii, exposing geosynchronous satellites to the direct solar wind. These phenomena are collectively called space weather. From the European Space Agency’s Cluster mission, a new study has taken place that proposes that it is easier for the solar wind to infiltrate the magnetosphere than previously believed. A group of scientists directly observed the existence of certain waves in the solar wind that were not expected. A recent study shows that these waves enable incoming charged particles of solar wind to breach the magnetopause. This suggests that the magnetic bubble forms more as a filter than a continuous barrier. This latest discovery occurred through the distinctive arrangement of the four identical Cluster spacecraft, which fly in a controlled configuration through near-Earth space. As they sweep from the magnetosphere into interplanetary space and back again, the fleet provides exceptional three-dimensional insights on the phenomena that connect the sun to Earth. The research characterized variances in formation of the interplanetary magnetic field (IMF) largely influenced by Kelvin-Helmholtz waves (which occur at the interface of two fluids) as a result of differences in thickness and numerous other characteristics of the boundary layer. Experts believe that this was the first occasion that the appearance of Kelvin-Helmholtz waves at the magnetopause had been displayed at high latitude dawnward orientation of the IMF. These waves are being seen in unforeseen places under solar wind conditions that were formerly believed to be undesired for their generation. These discoveries show how Earth’s magnetosphere can be penetrated by solar particles under specific IMF circumstances. The findings are also relevant to studies of magnetospheric progressions around other planetary bodies. This study suggests that Kelvin-Helmholtz waves can be a somewhat common, and possibly constant, instrument for the entrance of solar wind into terrestrial magnetospheres under various IMF orientations. Venus, the nearest and most similar planet to Earth, has 100 times denser atmosphere, with little or no geo-magnetic field. Space probes discovered a comet-like tail that extends to Earth’s orbit. 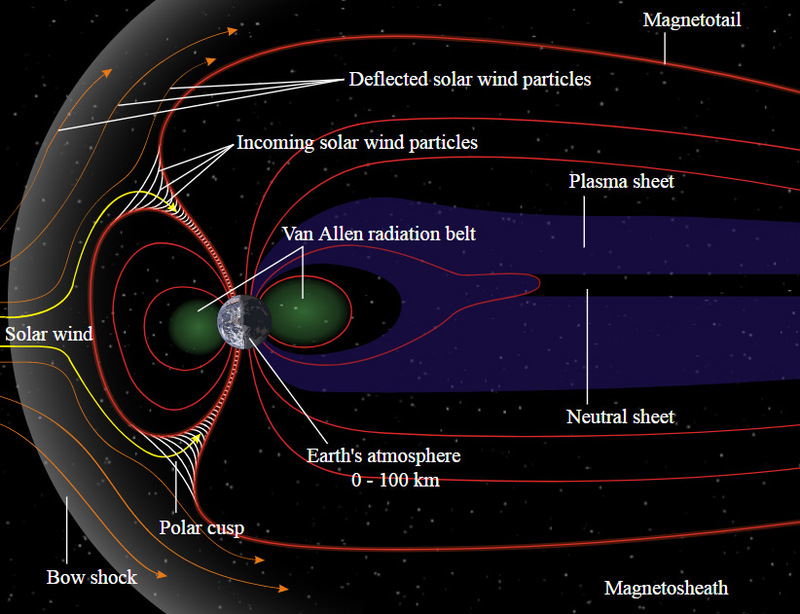 Earth itself is largely protected from the solar wind by its magnetic field, which deflects most of the charged particles; however some of the charged particles are trapped in the Van Allen radiation belt. A smaller number of particles from the solar wind manage to travel, as though on an electromagnetic energy transmission line, to the Earth’s upper atmosphere and ionosphere in the auroral zones. The only time the solar wind is observable on the Earth is when it is strong enough to produce phenomena such as the aurora and geomagnetic storms. Bright auroras strongly heat the ionosphere, causing its plasma to expand into the magnetosphere, increasing the size of the plasma geosphere and injecting atmospheric matter into the solar wind. Geomagnetic storms result when the pressure of plasmas contained inside the magnetosphere is sufficiently large to inflate and thereby distort the geomagnetic field. Although Mars is larger than Mercury and four times farther from the Sun, it is thought that the solar wind has stripped away up to a third of its original atmosphere, leaving a layer 1/100th as dense as the Earth’s. It is believed the mechanism for this atmospheric stripping is gas caught in bubbles of magnetic field, which are ripped off by solar winds. In 2015 the NASA Mars Atmosphere and Volatile Evolution (MAVEN) mission measured the rate of atmospheric stripping caused by the magnetic field carried by the solar wind as it flows past Mars, which generates an electric field, much as a turbine on Earth can be used to generate electricity. This electric field accelerates electrically charged gas atoms, called ions, in Mars’ upper atmosphere and shoots them into space. The MAVEN mission measured the rate of atmospheric stripping at about 100 grams (~1/4 lb) per second. The Earth’s Moon has no atmosphere or intrinsic magnetic field, and consequently its surface is bombarded with the full solar wind. 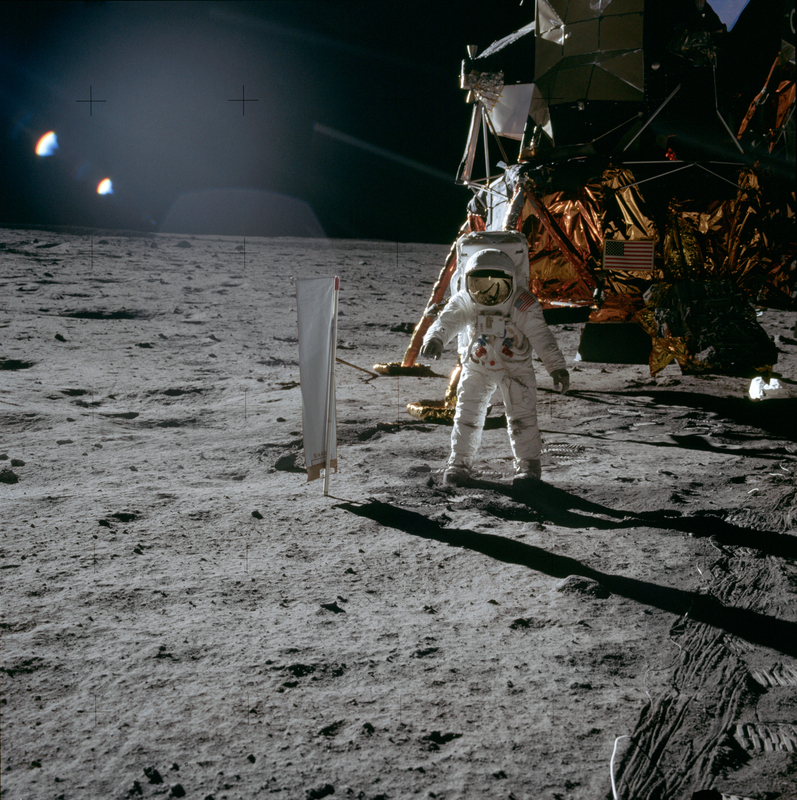 The Project Apollo missions deployed passive aluminum collectors in an attempt to sample the solar wind, and lunar soil returned for study confirmed that the lunar regolith is enriched in atomic nuclei deposited from the solar wind. These elements may prove useful resources for lunar colonies. The solar wind «blows a bubble» in the interstellar medium (the rarefied hydrogen and helium gas that permeates the galaxy). The point where the solar wind’s strength is no longer great enough to push back the interstellar medium is known as the heliopause and is often considered to be the outer border of the Solar System. The distance to the heliopause is not precisely known and probably depends on the current velocity of the solar wind and the local density of the interstellar medium, but it is far outside Pluto’s orbit. Scientists hope to gain perspective on the heliopause from data acquired through the Interstellar Boundary Explorer (IBEX) mission, launched in October 2008. From May 10 to May 12, 1999, NASA’s Advanced Composition Explorer (ACE) and WIND spacecraft observed a 98% decrease of solar wind density. This allowed energetic electrons from the Sun to flow to Earth in narrow beams known as «strahl», which caused a highly unusual «polar rain» event, in which a visible auroraappeared over the North Pole. In addition, Earth’s magnetosphere increased to between 5 and 6 times its normal size. On 13 December 2010, Voyager 1 determined that the velocity of the solar wind, at its location 10.8 billion miles from Earth had slowed to zero. «We have gotten to the point where the wind from the Sun, which until now has always had an outward motion, is no longer moving outward; it is only moving sideways so that it can end up going down the tail of the heliosphere, which is a comet-shaped-like object,» said Voyager project scientist Edward Stone.